BLOUNTVILLE — Sullivan County’s school board voted to approve a rock blasting change order for the new West Ridge High School site of more than $740,000 at a called meeting Tuesday night, and it also became aware of net savings of more than $220,000 that will reduce costs for the new school project. The Board of Education also learned about three “dropouts” or washouts at the West Ridge property, areas where holes have formed on the rain-logged site, that could cost tens of thousands of dollars, as well as about $2,000 more for a football field house. In addition, the seven-member BOE went into an hour and 45 minute executive session with board attorney Pat Hull and Nashville attorney Chuck Cagle to discuss a potential lawsuit against the County Commission for not allowing the board to spend $1 million in restricted reserves on a sewer line project for Sullivan East Middle School. “We just needed to have a private meeting with them,” BOE Chairman Michael Hughes said. Some commissioners have said Bristol, Tenn., might have the responsibility to fund the sewer line under the 1993 City-County Sewer Agreement and/or that the school system should use $750,000 originally earmarked for a sewage treatment plant, a proposed facility Tennessee health officials would not allow for the new school. School system officials said that amount was absorbed in the budget when the state nixed the treatment plant but that $1.5 million was set aside in a restricted fund. WHAT WAS THE CHANGE ORDER VOTE? The board voted 7-0 with little discussion to approve the change order for $742,662 for rock blasting performed from Nov. 12 to Dec. 28, an action that also extends the mass grading contract with East Tennessee Turf & Landscape until April 2. “We’ve hit more rock than we thought we were going to,” said architect Dineen West of Cain West Rash Architects, which along with LS3P designed West Ridge. Because of the unexpected rock, the soccer field has been moved near the baseball concession stand and the football practice field moved slightly. She said another deduction for less grading work is coming. 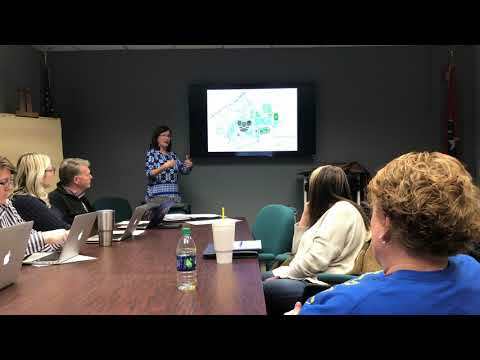 However, West said in answering a question by board member Mark Ireson that the field move will make it “cost prohibitive” to put in four additional baseball and/or softball fields, although she said one or two softball facilities might still be workable. She said the vote means the grading contractor will do two more blasts at the end of this week to keep the project rolling along. The move leaves about $750,000 in contingency funds for grading work. As for the contract on the main building, West said value engineering meant $224,465 in deductions, while a small addition to the field house will add $2,221 to that cost. J.A. Street & Associates of Blountville is the contractor on the main building and the outdoor athletic fields, which were bid separately. Charlie Hubbard, school system facilities and maintenance manager, said the value engineering changes all have been workable and acceptable to him and his staff. The more than $224,000 includes deleting laundry and greenhouse equipment. A 2-year-old greenhouse from Sullivan South High School is to be moved to the new school, while the laundry equipment can be bought directly by the county with no sales tax but installed by the contractor, Director of Schools Evelyn Rafalowski said. The whole high school project, slated to open in August of 2021, exceeds $60 million, while the middle school one, slated to open in January of 2020, exceeds $20 million. The two dropsouts on the high school site might cost about $15,000 each, West estimated, while she said it is too early to say about a third dropout. She said work continues to be delayed and that 2018 was the third-wettest year on record for the region.